What’s more important than launch week? Everything you do before and after. That’s what makes or breaks your success – especially as an influencer in 2019 (in an increasingly saturated marketplace). Tune in for another action-packed episode! And then head over to Instagram to share exactly what you’re planning between NOW + your next launch. 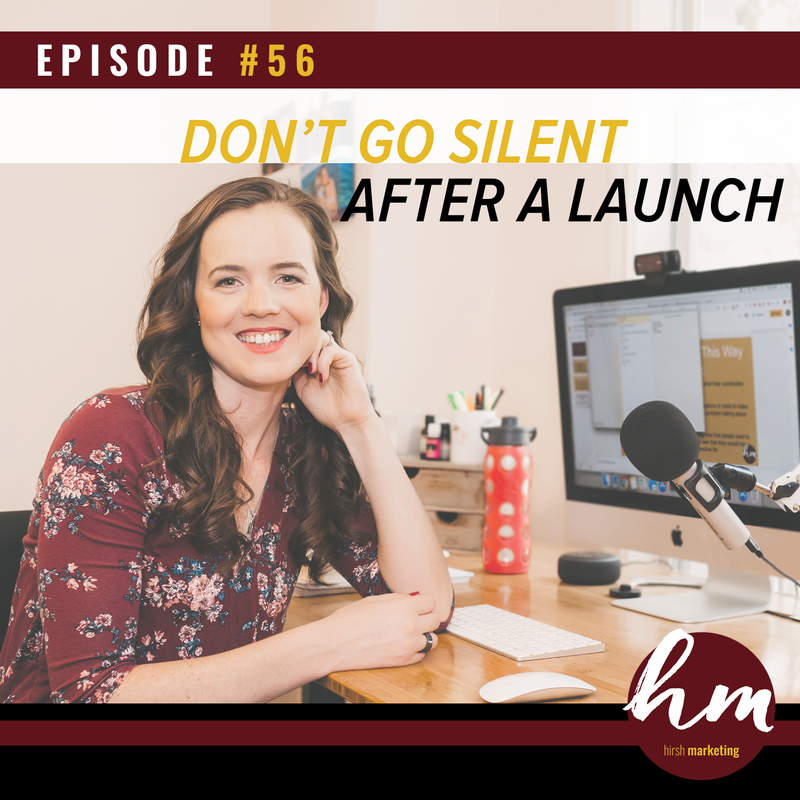 NOTE – Listen to episode 49, “What you do leading up to a launch is more important than the launch!” for more about my perspective on this; and listen to episode 48, “What nobody tells you about selling digital products,” for more about the myth of making money overnight. [3:58] Which direction is the industry heading? Today I’m coming to you guys with a little bit of a lecture to remind you something, which is, don’t go silent after a launch. It feels like launch season right now, maybe because we are deep in B-School, for multiple clients, but I want to share this because I think it’s so important. I’ve said this before, but what you do leading up to a launch is oftentimes more important than what you do in the actual launch. I want you guys to always just keep that in the back of your mind, because I think it’s really easy to plan for a launch, get everything ready for the actual launch and the webinars and the emails. It’s so much work. I know it is because we’re on the back end of these all the time. People put 150% of their energy into that, and what lacks is what happens after the launch and leading up to the next launch. And that honestly matters more because, like I have always talked about, we have such a huge value about connection. At the end of the day, marketing comes down to, can you connect with your ideal customer and client? If you just show up in a launch, it doesn’t matter how good your ads are, how good your funnel is, how good your webinar is, how good your emails are, it won’t be successful. That is the reality. What you have to do to have a successful launch is show up every other day that you’re not launching, building relationships, building trust, delivering value, and connecting with your people so that when it comes time to launch, it’s a no-brainer for people to purchase from you. Not only do I want to say this today, but I want to encourage you guys to actually plan this into your marketing strategy. If you know, “I’m launching in April,” and it’s February, what are you doing in between then? Then you know, “Okay I’m launching in April, and I’m going to launch again in October,” what are you doing in between then? Write it down. What does you content schedule look like? Are you going to go live on Facebook? Do you have podcasts coming out? How are you going to grow your email list? How are you going to drive traffic to your website so you can build that audience? How are you going to connect with your people exactly, like “I’m going to go live on Facebook once a week,” “I’m going to release two podcast episodes a week,” “I’m going to spend 5% of my total ad budget for the year on making sure I reach new people with that content,” because that’s a key piece of it is, not only do you have to show up for people, but you also have to connect with them and reach new people. If you just show up, your same audience is going to see it ever time, but if you show up and put ad spend behind that content, you’ll reach new people and your tribe will grow and your following will grow. Without even thinking about it, I said, “Here’s what I’m seeing: The people who value connection, visibility, brand awareness, and connecting with their tribe through valuable content are doing well. The people who have lost that, who don’t feel inspired to do that, who don’t put time and priority behind that are not doing well.” Influencers who have a following already that continues to grow, and they get talked about, and their products and their programs are quality, and so people are seeing results and talking about it, because they care … the bottom line is that they care and that their motivation is not just money, but it’s also getting people results and connecting with people and growing this bigger thing. I often have people tell me, “Wow, you give away so much on your podcast that I could go and just implement it and see so much results.” I said, “Yeah, I’m doing that on purpose.” Because I also know that my ideal client, they could have all the information in the world and how to implement it, and they don’t want to. So I put out all the value. I give it all away. I talk about all our secrets, and I share it with you guys because my ideal customer for Hirsh Marketing, they don’t want to do it themselves. Even if they had the knowledge to do it themselves, they don’t want to. I know my people. I know how I can show up to grow my people. I put so much time into that. After a launch and in between your launches, leading up to your launches, I want you to strategically think about, how are you going to show up? Write it down in your goals for your company, what’s the form of content that you’re going to show up in? Podcast, video, blogs, emails? It should be a multiple of those things. How are you going to grow your warm audiences so that when it comes time to launching, you’re not launching to cold traffic? You’re constantly working with your content to deliver that value, and it has to be related and go together, what you’re selling and the person you want to attract to sell with the content that you put out leading up to and after your launch. You can’t ever look at launching and just say, “Well, if I perfect my funnel and I hire everything out, if I hire out the ads, and I pay for the best funnel possible, and the best emails, and the copywriting, and the best ads team, and then I just let them do it, then I’ll see success.” You won’t. I will say no to a client like that on our team, because you won’t see success, because what you still have to do is show up and connect with people. If you’re an influencer, only you can do that. Don’t go silent after a launch. Connect with your tribe. Have the energy left over after the launch so that you can still show up on Insta-stories and on social media. The second piece to this on top of planning everything and knowing exactly how you’re going to show up with what content is actually putting aside a budget to make sure more and more people are constantly seeing that. With how much has changed in the industry in the last two years, people who aren’t doing this just are not going to survive. Part of my conversation yesterday when somebody asked me what am I seeing, I said, “On top of seeing that people who prioritize this are the ones who are doing well, it’s also getting harder and harder for a new person to come online, launch a webinar, launch a product, and see success.” Why? Because they come in launching their funnel, launching their webinar, launching their product, with no trust, no connection, no warm audiences, no tribe, and they’re trying to see success within 30 days because a lot of times they have to make money because they don’t have any money to put into it, which I did another podcast on that [episode 48]. It’s getting harder and harder for those people to see success. I said, “It’s going to continue to be harder and harder for a new person to come online and launch something.” If you have a following, you’re already 10 steps ahead of other people, because you already have a following and people who trust you, but you have to keep on growing that. You have to keep putting time and money into growing that.” So, don’t go silent after a launch. Plan for your launches ahead of time. Put connection with your audience first, because your numbers during your launch and your sales during your launch will show if you did that or not, I promise you. Thanks so much for tuning in today, guys. If you want to work with Team Hirsh, we have a few spots open. One of our biggest core values is this: connection, brand awareness, visibility, and setting up a unique custom plan for you, and really putting you in your zone of genius so that all you do is this. Because as an influencer, that’s where you should spend your time. Creating content, connecting with your audience, showing up as you so that people connect with you, trust you, and want to ultimately buy from you. Go to HelpMyStrategy.com if you’re interested in working with Team Hirsh. Thanks so much for tuning in today, guys.